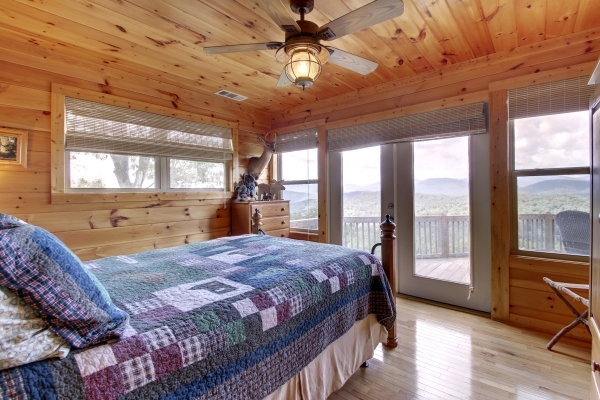 This lovely 5 BR, 4 BA cabin is totally amazing. Breathtaking mountain views enhance this beautiful cabin's appeal. Great for entertaining or a family getaway. Only 7 miles from downtown Helen, this rustic and tastefully decorated cabin is an ideal way to relax near Helen, Georgia. The property is beautiful! Breathtaking views, very peaceful. The cabin is very well accommodated with everything needed. The game room had everything we possible need and the hot tub on the lower deck was wonderful watching the sunset. The brochures, menus and information left by the owners was very helpful also. It was also very wonderfully decorated. Our stay was enjoyed by our entire group and we look forward to going back. Very helpful when we initially had another property booked, realized it wouldn't work, and found us another one. Love The Summit. Perfect for big, non family group because so many beds. The house was great! Plenty of space for a large group, we never felt crowded! Awesome views and it was great having the space downstairs with the game tables and the outdoor patio! This was our second year staying in the same cabin and we plan to book it again! Excellent every time I called to change dates or ask questions about the town, etc. they were very helpful! MANAGER RESPONSE: We appreciate the kind words and look forward to serving you again! We loved the decor! Your comfy, cozy, but also very large cabin was perfect for our group of girls. We had everything we needed for the best weekend we could have hoped for!! • Some mountain roads are gravel and narrow. • The Damage Protection Fee depends on the size of the property. A $25.00. 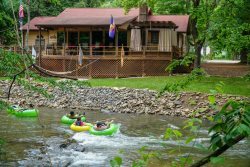 $55.00 or $75.00 non-refundable damage waiver is added to every reservation. This waiver will cover up to $700 for accidental or inadvertent damages. This is only applicable if the damages are reported at the time of the incident. During office after hours guests must report any damages immediately by email to [email protected], stating their full name & address of property and a full description of damage with photos if possible. For damages or accidents considered an emergency call 770 530 8248. Photos of damages may be texted to this phone number, with full description, name of guest and address of property. If guest chooses to opt out of paying the mandatory DPF a substantial deposit will be required and placed on the guest's credit card in lieu of DPF. This money will be held until a post departure inspection is completed. If there are no charges against this deposit, deposit will be refunded minus a $50 processing fee. Please note that once you have chosen the deposit option, to change back to the Damage Protection Fee, you will incur a charge of $100. • Credit Card - Must Remain On File for Damages Exceeding $700.